It was about 4:30 p.m. in British Columbia, Canada, when my sister’s iPhone buzzed merrily to tell her she had just been sent a video on iMessage. Not the most traditional of New Year greetings, but first consider the circumstances. The night began with us savouring bottle of Domaine Jasmin Pinot Gris 2012 from a tiny vineyard on Thetis Island, B.C. Very likely the only bottle from this winery to wend its weary way to the U.K., we were sure to enjoy it while out taste buds were still capable of appreciating what we were drinking. Then we progressed to the Prosecco, a fine example from Conegliano, which we dispatched in good time. And because we hadn’t yet eaten dinner and the night was still somewhat young, there was the humble but entirely appropriate Bottega Vinai Lagrein Dunkel 2011 to go with dinner. It was at this point that I started to lose the ability to appreciate whatever was in my glass. My head was growing a bit fuzzy and my palate tired. But this was New Year’s Eve and I wasn’t going to let a little fatigue slow me down. So of course I felt that it was now coming up to just the right time to chop off the top of a bottle of Champagne. And even better, it absolutely must be recorded, I announced with all the confidence of someone who appeared to have done it dozens of times before – but had only ever stood next to someone who did. I had my moments of doubt, of course, but I learned from my father the trick of closing one’s eyes and just hoping for the best. Using this method, similar to the Hail Mary play in American football, things tend to pan out for the best nine times out of time. As it happens, sabring a bottle of Champagne is actually incredibly easy. It is also incredibly easy not to put any thought into where the top end of the bottle will be fired. Particularly when you are operating on the pinot gris, proseccco and lagrein that came earlier in the evening. When my sister watched the video, by which time it had become distorted and blurred by the compression process needed to sent over the mobile network, she likely didn’t see the look of concern that fell over my face just a few seconds after I popped the cork. This moment, in which my face dropped from pure satisfaction to genuine worry when I wasn’t sure if I had just caused irreparable damage to half of my kitchen, was ultimately too blurry to catch and, thankfully, rather brief. In this case, my cork-shaped missile was launched in the direction of numbers 1, 4 and 5 above. It narrowly missed the window and the coffee cups, but I made a direct hit against a large ceramic mixing bowl and the rest of the contents of the drying rack. Much to my delight, I hadn’t broken anything. But the following day I was charged with the task of carefully unstacking the dishes, sweeping up all of the glass shards that were scattered on the just-wash dishes, a re-washing anything that looked remotely tainted by small flecks of green glass. Just as the Hail Mary pass can help you get away with a desperate move from time to time, I got away with it on this occasion. Next time I’ll aim the bottle in the other direction – and hope that it doesn’t fly through our kitchen’s glass ceiling. 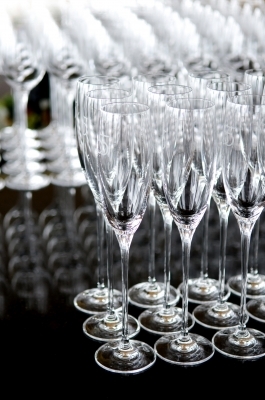 ← Champagne: Does it matter what we pop on New Year’s Eve? Excellent! Always fun to hear other sabotage stories! Now you need to do it with a Champagne flute. Happy New Year! I’d have used a flute were it not for the fact the ones I have were an Xmas gift from K.N. and I didn’t want to risk destroying one!